Double albums can present a risk especially in these challenging times for enhanced content. However, if they are put together as thoughtful as this new release from Susan Cattaneo then any foray into the unknown is underpinned by assured protection. THE HAMMER & THE HEART is a neatly packaged compendium of concepts, collaborations and contrasts. At the core, is an artist striving for an independent stance and backing an ability to make an impressionable record. These has been achieved through a strident act of duality, with sufficient appeal to make those of a country, folk or Americana persuasion sit up and take note. Weighing in with near symmetrical proportion, each disc mirrors the nine track – thirty plus minute format. 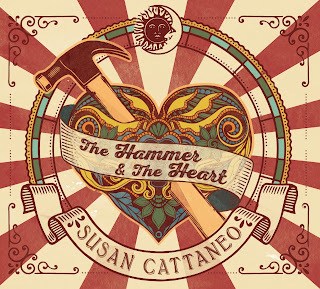 As intimated in the title, THE HAMMER generally contains the upbeat punchy numbers, while its counterpart THE HEART takes a deeper and mellower look at the song writing content. Both discs start with the same song, albeit in different styles. ‘Work Hard Love Harder’ is the track, carrying the album’s motto and largely being the true soul of the record. The up tempo version sees a link up with St. Louis based rock ‘n’ roll band The Bottle Rockets. The stellar opening line ‘the heart beats louder than the dollar’ has a more profound effect on the alternative version, but either take is a suitable introduction to each disc. The other sixteen tracks are a general mix of originals (both of a solo and co-write status) and carefully crafted covers. The four falling into the latter category come from a variety of diverse backgrounds. ‘Back Door Slam’ and ‘Everybody Cryin’ Mercy’ call at the blues; a grungy version of Buddy and June Miller’s ‘Does My Ring Burn Your Finger’ tips the hat towards Americana, while a three-part harmony version of ‘Space Oddity’ requires little explanation. While the debate on the value of a cover will probably never be resolved, the desirable worth of Susan’s writing is indisputable. Two great collaborations with Bill Kirchen illuminate THE HAMMER disc, headed by some lightning telecaster work on ‘In the Grooves’, an ode to the traditional way of listening to music. The other takes the form of a standard duet, with ‘Loves Goes Right’ being the perfect antidote to the break up country song. A refreshing sentiment that can often be underplayed in the genre. Further more intense personal thoughts, as you would generally expect from title’s inference, take hold on THE HEART in the form of ‘Ordinary Magic’, ‘Bitter Moon’ and ‘Smoke’. Accompanying a copy of this album is a detailed personal insight into each song that aids the understanding. The merit of this approach puts Susan Cattaneo firmly in the camp of wanting to get her message over, rather than giving listeners a licence to roam. The bottom line is that the music wholeheartedly retains the tone to speak for itself and can also stand alone without the conceptual background. Other picks from enjoying many entertaining listens to the album include the Mark Erelli co-write ‘The River Always Wins’, and another tune with an environmental spin, ‘Field of Stone’. ‘Ten Kinds of Trouble’, complete with the memorable line ‘Elvis in your soul’, is another track to head in a bluesy Southern direction, clearly showing the New England born, raised and based Cattaneo in a comfortable adopted role. 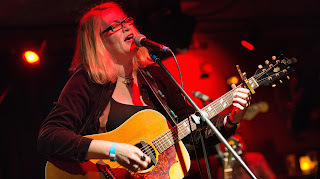 Having previously given two of her releases – HAUNTED HEART and LITTLE BIG SKY – a seal of approval here, there was a period of letting the extensiveness of this meatier product bed in. 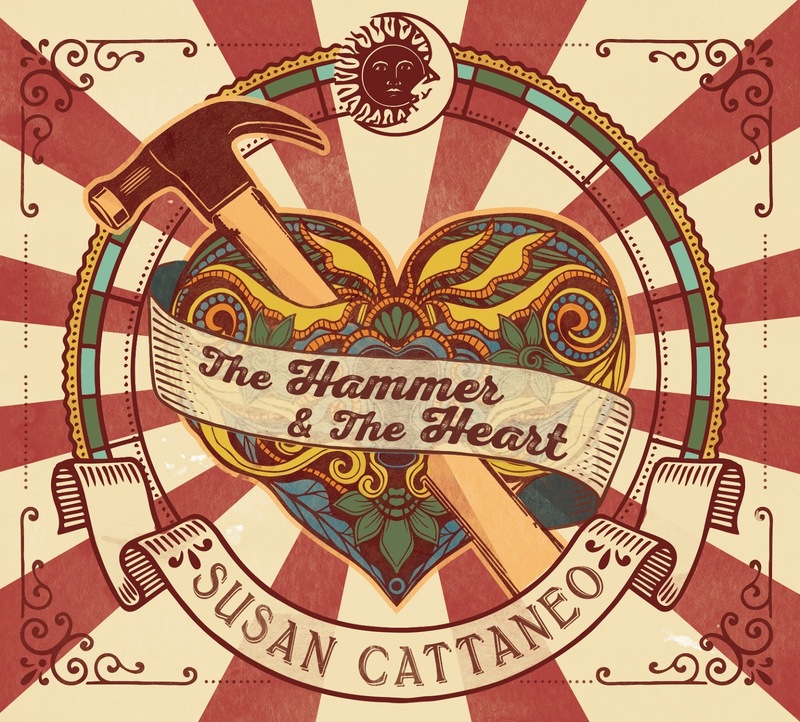 Make no mistake, THE HAMMER & THE HEART is a brave ambitious project, but its adeptness, classy construction and tapping into the wealth of sincere sentiment have yielded Susan Cattaneo a high degree of success. Ultimately, it has evolved into a formidable album to engage with a growing band of listeners.